Before starting a new game, you will need to create your your avatar. This will be your story’s protagonist, and you have the power to determine their characteristics. During character creation, you can select one of six origin characters. These are specific characters in the world, each with their own story to tell. They will have a unique outlook on the world, in addition to their own personal subplot that will be experienced in tandem with the main plot of the game. 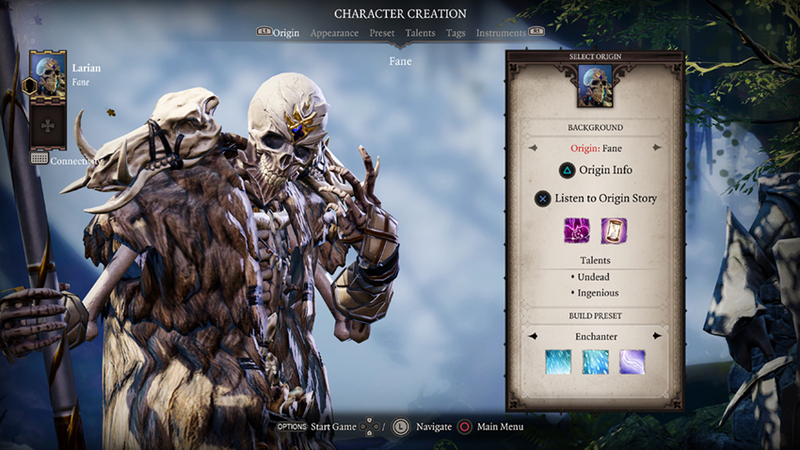 They gain a specific Origin Tag which gives them unique dialogue options and their own story, goals and history within the world of Rivellon. 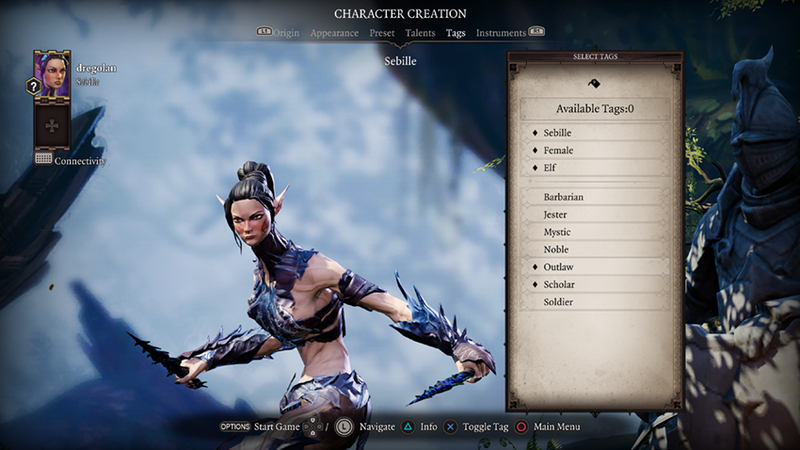 If you would like to make someone with your own story to tell, select custom and choose which race and gender you want your character to be. Later, you will need to select two profession tags from the “tag” tab. 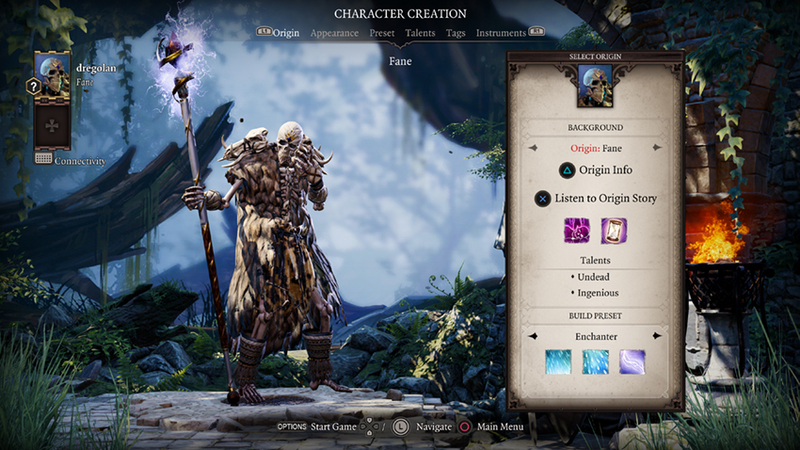 Divinity: Original Sin 2 is a classless game, which means that a hero (or villain!) 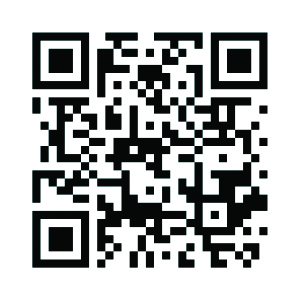 can use any type of weapon or armour, and he or she can learn any type of ability available in-game. Therefore, you don’t select a class during character creation, but you do have to set up a build. The build preset is the role of your character within the party. Will they be a fighter or a spellcaster, a thief or a ranger? If this is your first playthrough and you are not yet familiar with the game’s rules, one of these presets will help you build a well-balanced character. If this is not your first play through, or if you have played many RPGs before, go ahead and customise your characters to your heart’s content by tweaking their attributes, skills, talents, and abilities. There are five races in the game; Human, Elf, Dwarf, Lizard and Undead. Each of the races have unique talents and abilities, including their own interesting ways of interacting with the world. For instance, only elves have the Corpse Eater talent, which allows them to eat body parts. Not only do they heal from it, they can also access the memories of the dead this way. Playing as an undead (of any race) poses unique risks… and benefits. Undead must veil their true selves from the living or risk being attacked. Healing potions and healing spells will damage them, while poison heals. Undead can pick locks with their fingers and can survive Deathfog.